Calendar management is not easy, especially when many of us are juggling multiple calendars, with work and family commitments and often, activities outside of both that need a diary reminder. Some of the most popular calendars include Apple, Microsoft Office 365 and Google. All of them operate separately, all of them can be shared with others and have multiple input points, making time management even more confusing, complex and stressful. No one wants to schedule a meeting or dinner, only to find you are already meant to be somewhere else or in another meeting. Unfortunately, with multiple calendars - some that we may not check every day - and paper-based to do lists and scheduling books - it’s too easy to double or triple book ourselves, or forget something is planned when you are distracted by something else. As Apple users know, or anyone who sticks to one platform/operating system across the same device, a diary entry on a phone automatically syncs across to your other devices. 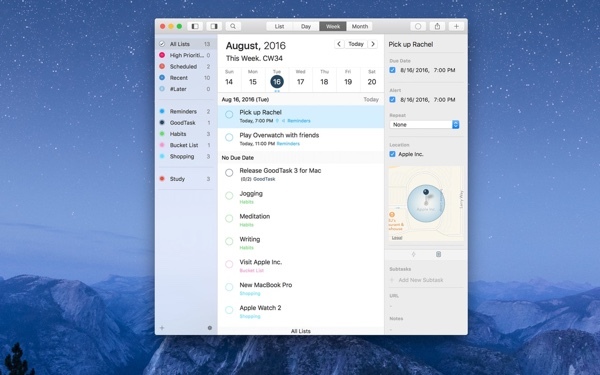 So scheduling a meeting on your Mac will show up - and alert you - in your iOS calendars. Great! That makes things somewhat easier. It only gets more complex when you rely on calendars using more than one platform/operating system, such as Windows and/or Google. Using three can get awfully confusing, especially when you write meetings down too. Make sure you schedule anything on paper into digital calendars; otherwise you won’t know if you are coming or going. For most with a secondary calendar, it will be linked to an email address, such as Google (Gmail) or Microsoft (Outlook). How effective you sync this depends on whether you have email on one or more devices. However, if you can sync a secondary calendar on one device, such as a laptop, that connection usually works on a mobile too, whether or not you have email on that device. Apple makes it easy to pull calendar notifications from other platforms, such as Windows and Google, since iCloud gets the data from both platforms, simply giving you the option to click to add them to your iOS/Mac Calendar. Can You Merge Two Google Calendars? Yes, you can. Similar to Apple, Google is keen to make it easier to use their platform as a professional and personal life organizer. Within Google Calendar, you can display, with a few clicks, data from one or more calendars, making everything visible within one calendar, so that you don't risk missing an appointment or meeting. Setapp also makes it a lot easier to manage multiple tasks and calendars. 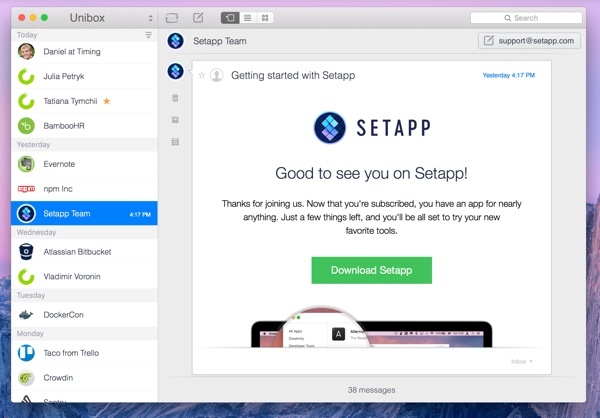 With Setapp, you can get Unibox, an app that handles your mail communications, grouping emails by sender. To expand your planning capabilities, try BusyCal. This flexible calendar app allows you to customize views, integrate tasks and lots of other details into your schedule. 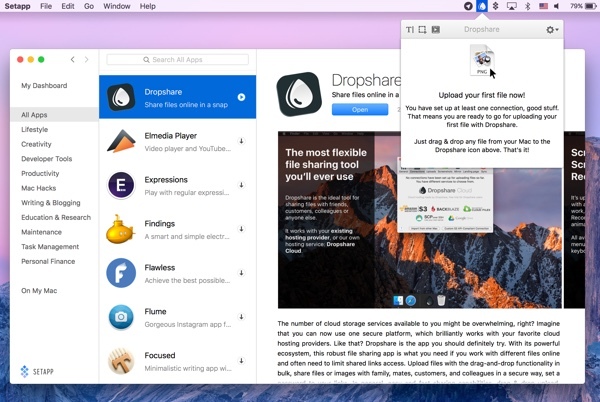 Dropshare is a useful time and task management application, that makes juggling different calendars easier. GoodTask adds rich functionality and makes managing complex tasks and multiple to-do list items easier. You can even manage calendar events across multiple Apple devices. At the same time, with Unibox, you can manage your email more efficiently. Emails and attachments can easily get lost in a busy inbox, especially when you are answering emails on the move. Instead of searching for information, Unibox supports and works with dozens of popular email services, integrating across any device, giving you powerful features that will keep your inbox under control and quickly identify messages, attachments and focus more effectively on communicating instead of managing your inbox. Thanks to Setapp, you can download these and dozens of others from one source, and avoid paying extra for premium features, all for one affordable payment. 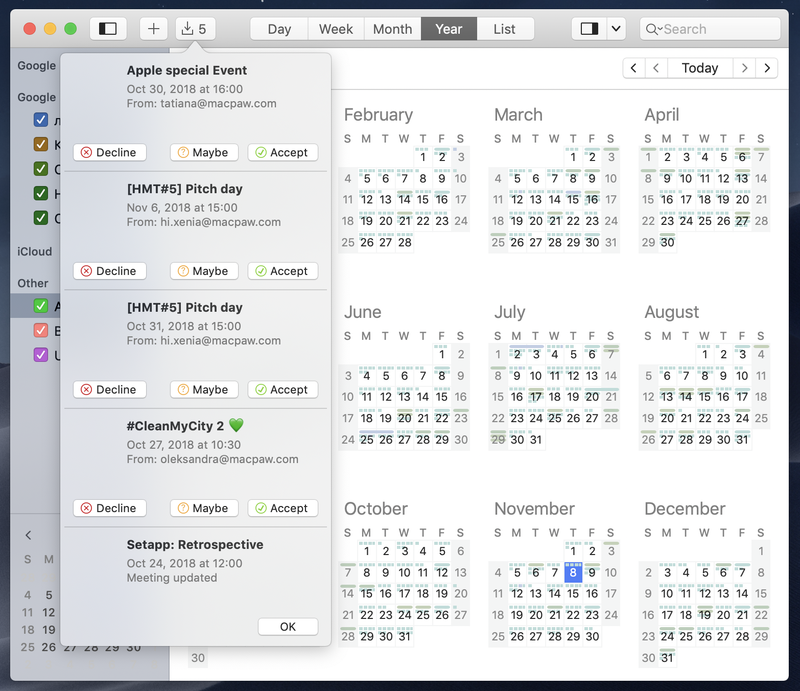 Setapp makes managing multiple calendars a lot easier - perfect when you’ve got too much going on and not enough time.